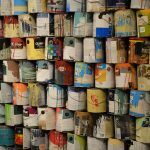 The B Side of Benson Theatre is pleased to showcase the work of artists Maggie Heusinkvelt and Stephen Kavanaugh through Jan. 18. Read more about the artists below. Born and raised in Martell, Neb., Maggie has always admired the outdoors and the beauty that surrounded her. She graduated from Norris High School in Firth, Neb., and attended the University of Nebraska-Lincoln, where she studied photojournalism. Shortly after Maggie began studying at UNL, she uprooted herself and moved to Omaha to pursue a career as an artist instead. Now, almost four years into her career, she has found a love for public art. With three public murals in Omaha and a fourth in Lincoln, she hopes to continue a career as a mural artist. 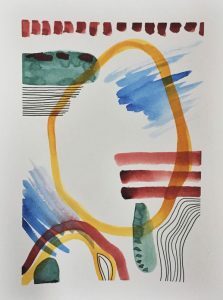 By playing with saturated color palettes and simplistic shapes, Maggie’s work explores the relationship between humans and the living world around us. Primarily focusing on landscapes and wildflowers, she stays true to her love of over-saturated colors by painting with unrealistic tones. 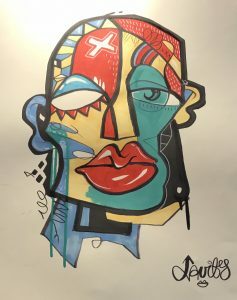 Stephen Kavanaugh lives in Omaha and practices in mural work, cartooning, street art, and frequently produces live paintings. He has completed a number of murals in Omaha, including at the University of Nebraska Medical Center and the Down Under Lounge. Stephen has also illustrated a children’s book and self published two coloring books. He plans to continue working in Omaha and helping expand the Omaha art community in a number of unique ways. 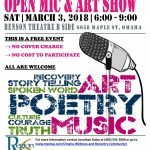 He currently teaches art to adults with disabilities and actively engages them in the Omaha art community through Angel Works, a local nonprofit.